TULSA, Okla. — A group of Muslim Americans in Oklahoma have started a new nonprofit to help highlight their community's philanthropic efforts and help others better understand Islam. The organization, called Muslims4Mercy, started planning in June in Tulsa, Oklahoma, the state’s second-largest city. Muslims4Mercy has a three-pronged vision for its work: The first is to deliver 100 meals after Friday religious services to people across Tulsa using their high visibility, school bus-colored van. They will also provide hygiene kits, blankets, and other items to the homeless. “It’s all inclusive to everyone in the community regardless of skin color," Shimi said. "We include everybody and help everyone we can.” That effort is scheduled to formally start in October, she added. Muslims4Mercy hopes that the business, which is scheduled to start next year, will turn in to a for-profit café, the third part of the initiative, Shimi added. There are between 35,000 and 40,000 Muslim Americans in Oklahoma and the number is growing, according to the state's chapter of the Council on American-Islamic Relations (CAIR-OK). "We have seen a large growth in recent years with Muslims moving to our state to work in the medical, academic, oil and gas, and other fields," Adam Soltani, executive director of CAIR-OK, told NBC News. "People have also moved to Oklahoma seeking a better quality of life for them and their families due to our low cost of living and less hectic lifestyle." "The biggest growth has been in the Oklahoma City and Tulsa metro areas where we have witnessed expanding Islamic centers and the growth of our Private K – 12 education institutions," he added. Soltani also noted that there has been a "drastic increase" in the number of hate-related incidents in recent years. According to a July 2017 CAIR report, the number of anti-Muslim hate crimes in the U.S. during the first half of the year were up 24 percent compared to 2016. Ravi Sharma, president of Muslims4Mercy, was in charge of a similar public affairs initiative in Seattle and said it brought the community together. He added that he thinks it’s important for the Muslim community to be visible in their efforts, noting that the group is making sure that the weekly deliveries will be consistent with a regular stream of volunteers. The deliveries may eventually work up to three days a week with the help of local churches and synagogues. 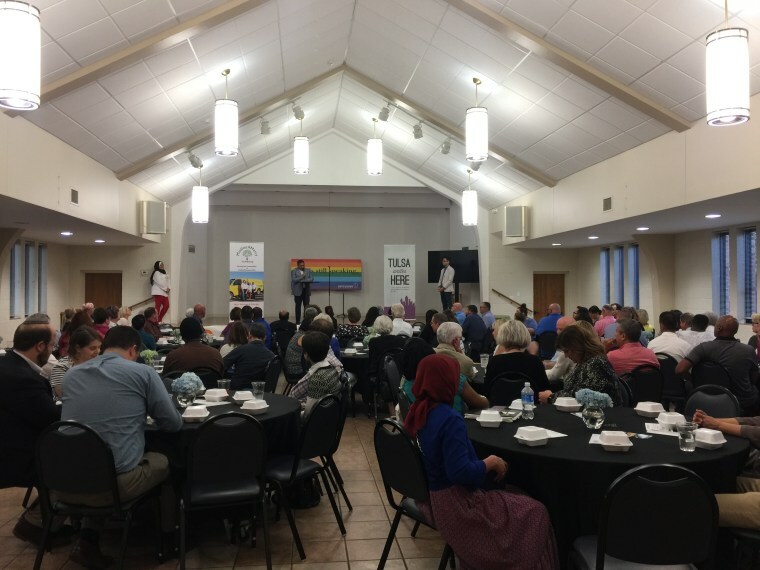 Muslims4Mercy also recently held a welcoming iftar dinner event at a local church in Tulsa that included interfaith leaders, elected officials, and community members to talk more about homelessness and what can be done to help. Pastor Chris Moore offered his church, Fellowship Congregational Church, to host the dinner. The dinner touched on homelessness and race, and built upon a discussion that had started weeks earlier by The Oklahoma Center for Community and Justice (OCCJ) following the events in Charlottesville, Virginia. Moises Echeverria, president and CEO of OCCJ, said Muslims4Mercy will positively highlight the good work that the community is doing. He said it’s important to have meaningful conversations about hate and diversity and to come together and reach out to folks who are different. Before the dinner, participants dropped off donations to be transported to Dallas to help Hurricane Harvey survivors. Shimi personally drove the items to the Texas city to show the group’s support for Texans trying to recover from the catastrophic event. “Muslims, like everyone else, do a lot of community service. That’s one of the huge tenets of the five big tenets of our faith." One of the community members at the dinner, Mandy Winton, said she doesn’t identify as religious, but loves learning about different religions. Winton said there are misconceptions about Islam, but events like the iftar dinner show the commonalities among a wide array of individuals. Shimi, the vice president of the Muslims4Mercy, said while misconceptions have been especially pronounced recently, she’s hopeful that the people of Tulsa can come together and overcome differences. “I’m very optimistic as a Muslim in the Tulsa community,” she said.